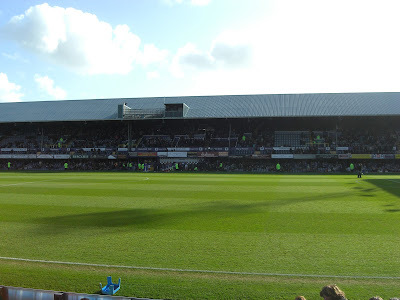 My sixth stadium of 2012 was on Saturday 3rd March 2012 at Fratton Park in Portsmouth, Hampshire. The match was Portsmouth vs. Middlesbrough in the Football League Championship. 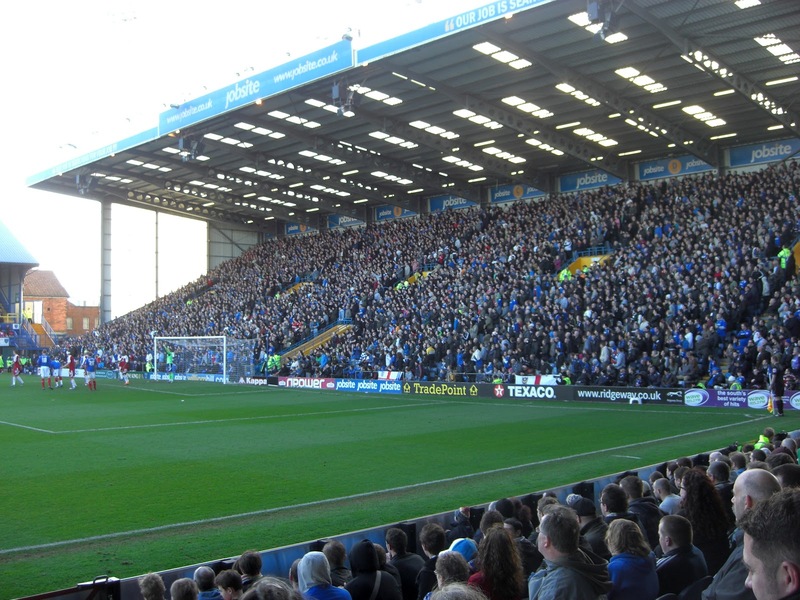 Fratton Park is located in a built-up area to the west of the city centre. The ground is half a mile from Fratton railway station and has been home to the club since they formed in 1898. Fratton Park is very much an old-style stadium with only the Fratton End, which was built in the 1990s, giving off a modern feel. This cantilever stand sits behind the goal on the western side of the ground and has a capacity of just under 5,000. At the other end of the pitch behind the goal on the eastern side of the ground is the Milton End. As it can only hold around 3,200 fans, this is the smallest stand in the ground with the northern half of it given over to away fans. This stand was uncovered until 2007 when a roof was installed. The South Stand is a two-tiered stand which runs along the length of the pitch on the southern side of the ground and features the iconic mock tudor entrance. As the upper tier is built directly on top of the lower tier, the capacity is less than 4,000 and it is fairly cramped. On the opposite side of the ground is North Stand, a more traditional two-tier stand. With a capacity of over 7,500 it is the largest stand in the ground and there is plenty of space for fans in this area and this is where I watched the game from. The game saw a poor first half punctuated with stoppages for various injuries. Chances were at a premium with neither goalkeeper having much work to do as the teams went in goalless at the break. 10 minutes into the second half the visitors were awarded a penalty after a push in the box and Barry Robson dispatched it to put Middlesbrough 1-0 up. Just after the hour mark this lead was doubled when a free-kick into the box caused all kinds of problems for the Portsmouth defence and Matthew Bates bundled the ball home from close range. A couple of minutes later the hosts were given a lifeline after a handball in the box led to a spot-kick for Portsmouth. Greg Halford put the ball past the Middlesbrough goalkeeper to bring the score back to 2-1. Portsmouth then went on the attack and in the 83rd minute found themselves exposed at the back as Marvin Emnes rifled the ball into the roof of the net after Portsmouth goalkeeper Stephen Henderson had made a good save from Adam Hammill's shot. Middlesbrough were reduced to ten men deep into stoppage time when defender Rhys Williams received his second booking but this did nothing to change the result as Middlesbrough ran out 3-1 winners.